Town: Crawley, west sussex, UK. 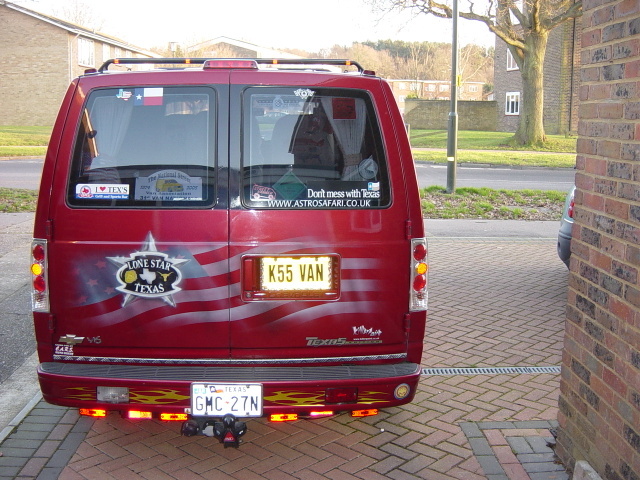 I have owned American Vans since 1982, and have run GM built vans since 1976, I am a founder member of SoLo Truckers a van club based In SOuth LOndon, but with members nation wide, we meet at car and van shows throughout the year. 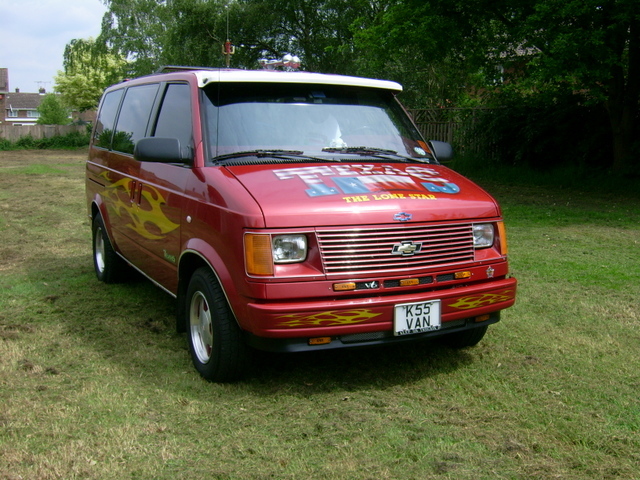 This van was imported from Florida in about 2002 by a UK dealer, It was originally sold by a dealer in Florisant, MS and was a Royal Palm Coach conversion (not been able to find much about this company) I am the 2nd UK owner and purchased it from a friend. 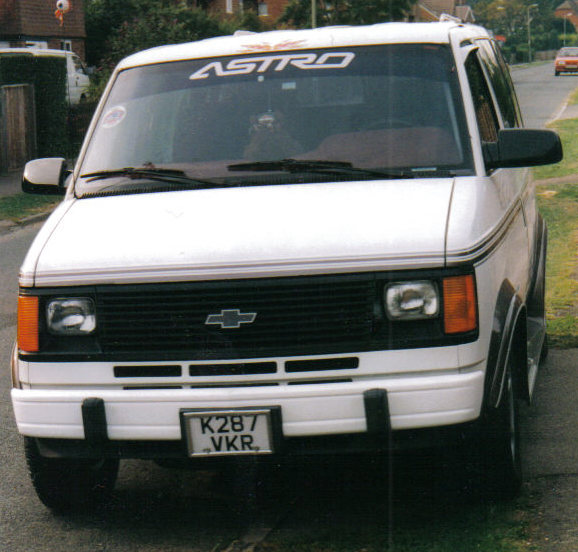 It is my first Astro, and it replaces a GMC Vandura we had before, We got the astro for its economy compared to the full size van, we average about 24 mpg highway (remember this is IMPERIAL gallons which are bigger than US gallons) and when towing our caravan (Travel Trailer) get about 18mpg. 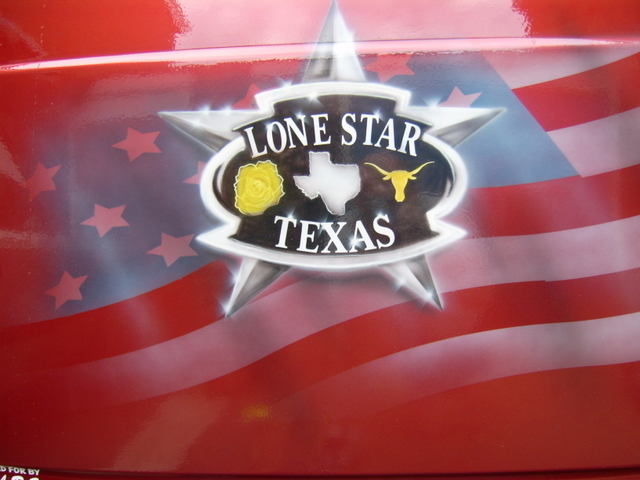 When We first got the van it was white some bronze stick on stripes, I wanted something different and my wife and I decided to carry on the theme of our previous van That had come from Texas. 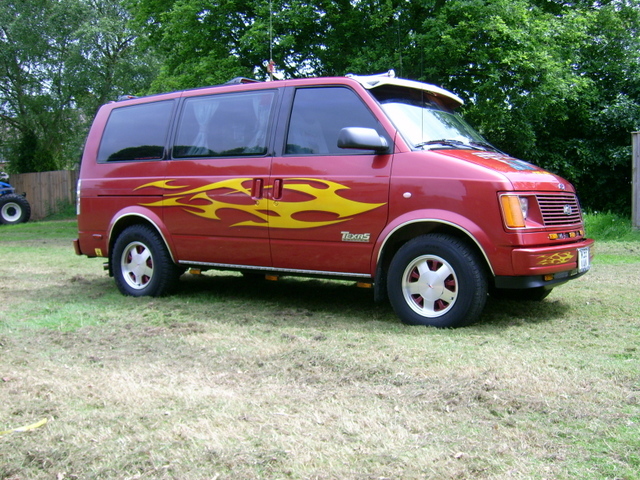 The front and rear artwork was designed by ourselves and the main body color choosen too, The rest was left up to John Hooper and Andy at www.killerpaint.co.uk they decided that the sides needed something to break them up and did the tribal flames designs. After the paint was completed the interior was ripped out and changed for something more suitable to our use. 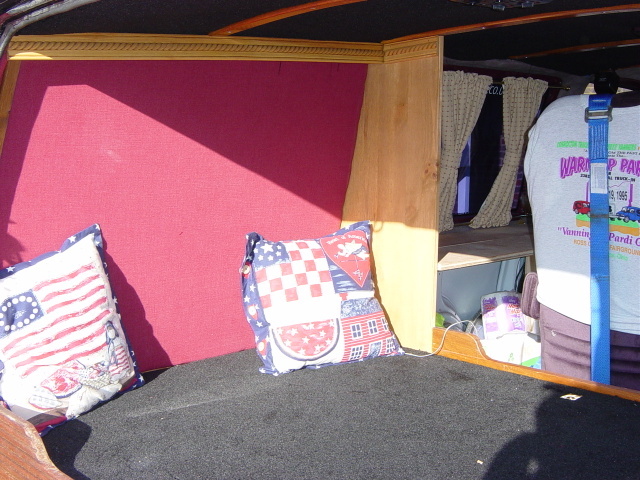 The rear sofabed was removed and replace with a platform bed (very 70s van) with storage beneath accesable from the rear doors or thru a lift up panel in the front, this was cover with short pile black carpet and then it will have a 3" foam mattress in 2 halves on this, the idea being that we have a comfy rest area with the foam mattress or by removing it a flat area for hauling stuff at vacation time. 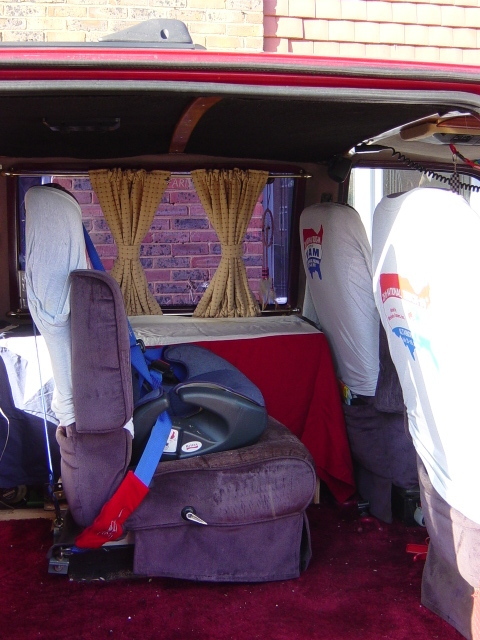 The side rear windows have been panelled over from the inside using 1/4" ply covered on the window side with short pile burgundy carpet and on the inside with 1/2" foam covered in burgundy upholstery material. 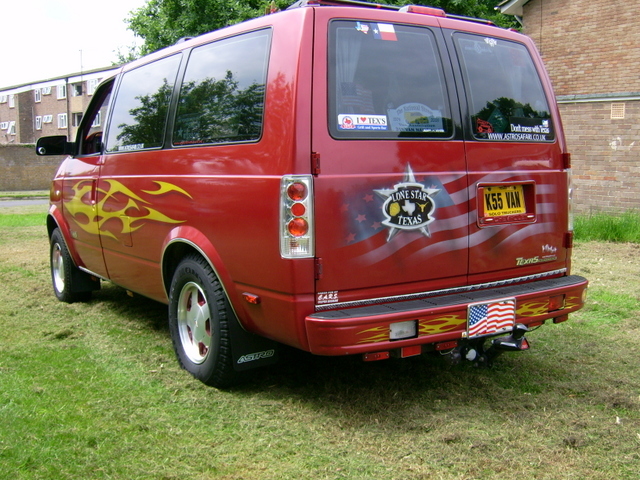 this gives us some extra privacy in the rear. 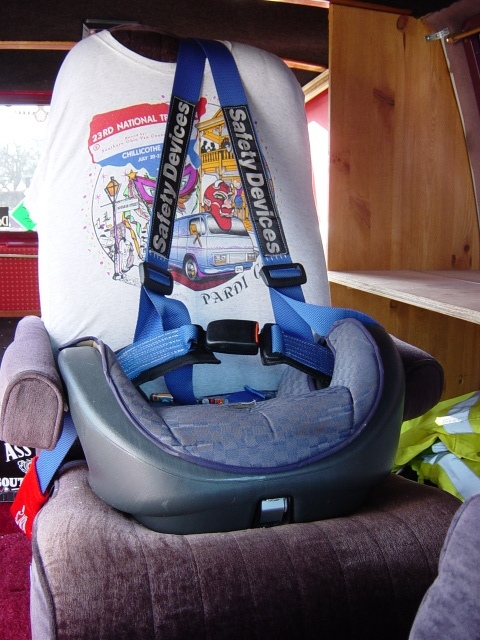 The centre highback seats were removed and then a single highback replaced nearer the centre of the van, this seat is for our daughter (who is 6 ) Its position allows her to see forward more easily and also allows for the installation of a storage chest along the left side from the bed divider to behind the drivers seat, this chest is still being designed and built to optimise space for all that a 6 year old needs on a long journey. At present all the seats are the original conversion ones and either need recovering or replacing (a trip to the wrecking yard me thinks) Although I have recarpeted the floor once already, I am not happy with the result and have some more long pile burgundy carpet to install (They don't seem to do the old SHAG PILE of the 70s that hid so many mistakes) under this carpet will be some 10mm foam to cushion the floor slightly. 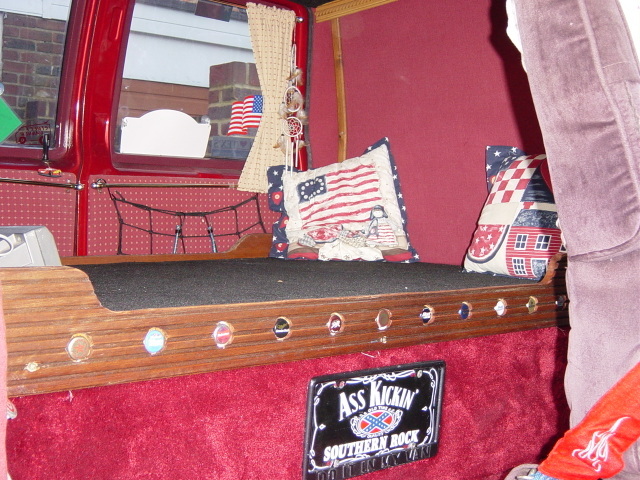 In the cab I have added a overhead centre console which I got at a car show, it for an American vehicle of some sort but I don't know what, this has lights and some storage for glasses Etc, at the front is mounted the CB. Sounds wise is very boring just a stock Blaupunkt radio/C.D Player thru some replacement speakers in the dash, and some after market ones at the rear. Roof mounted air horns supplied from a cylinder of compressed air ( 2000 psi, regulated down to 90 psi, so far the cylinder has lasted over a year !) Wheels are stock GM items brought from a friend who fitted 18"s to his Safari, these replaced some truly awful 5 spoke alloy wheels. 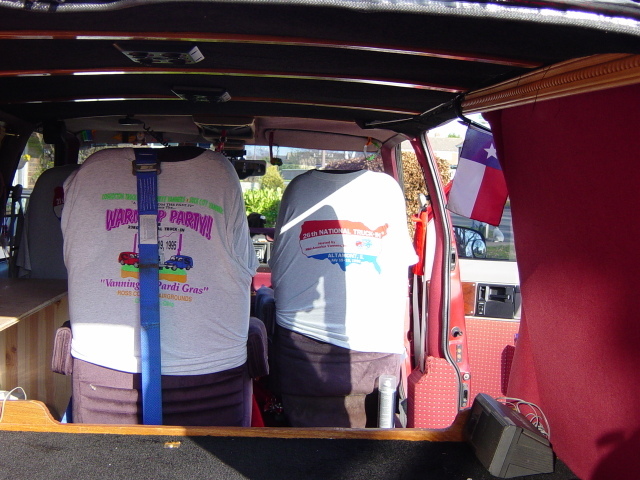 Future plans include changing the rear springs for steel items for better towing support and air shocks too. 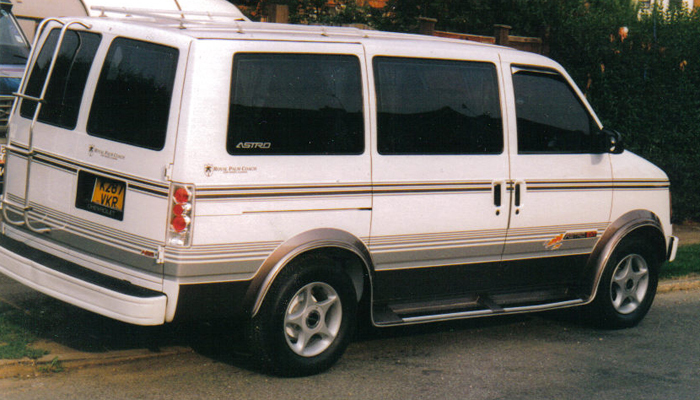 would also like to get an overland vans lift kit but the shipping is the killer on this item as it will cost as much again as the initial cost to get it to the UK. 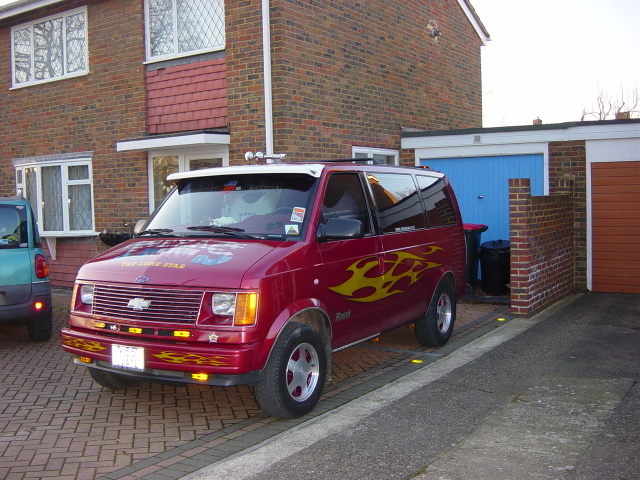 If time and money was no object then I would love to do a project on the van fitting a 6.2 GM Diesel with overdrive automatic transmission. 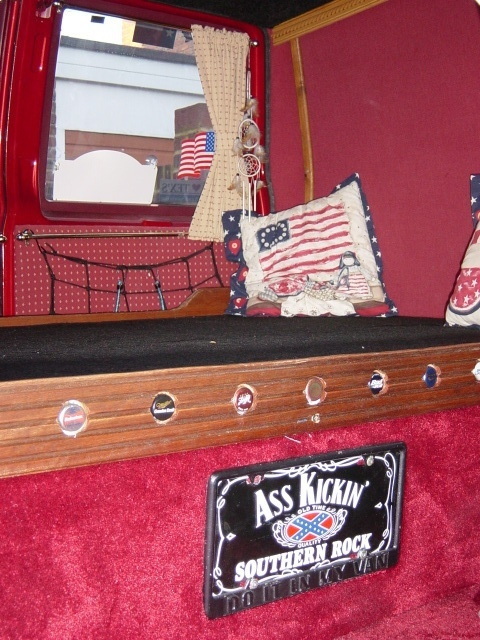 as you can see from the pictures the interior is still work in progress, and I do as much as I can when I have time, most of the work is done on the front drive so it is all weather dependant. 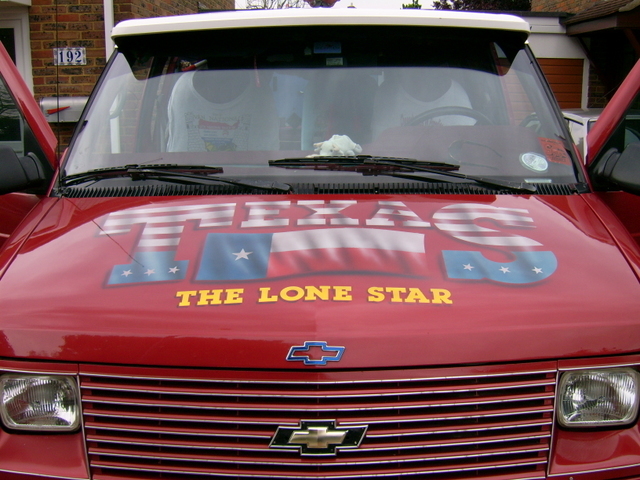 The van is called "The Lone Star" and we are always on the look out for Texas Related items for the interior.